Researchers at the University of Illinois at Urbana-Champaign have demonstrated for the first time how low-power “optical nanotweezers” can be used to trap, manipulate, and probe nanoparticles, including fragile biological samples. “We already know that plasmonic nanoantennas enhance local fields by up to several orders of magnitude, and thus, previously showed that we can use these structures with a regular laser source to make very good optical tweezers,” explains, Kimani Toussaint, Jr., assistant professor of mechanical science and engineering at Illinois. “This is exciting because, for the first time, we’re showing that, the near-field optical forces can be enhanced even further, without doing anything extra in terms of fabrication, but rather simply by exploiting the high-peak powers associated with using a femtosecond (fs) optical source. 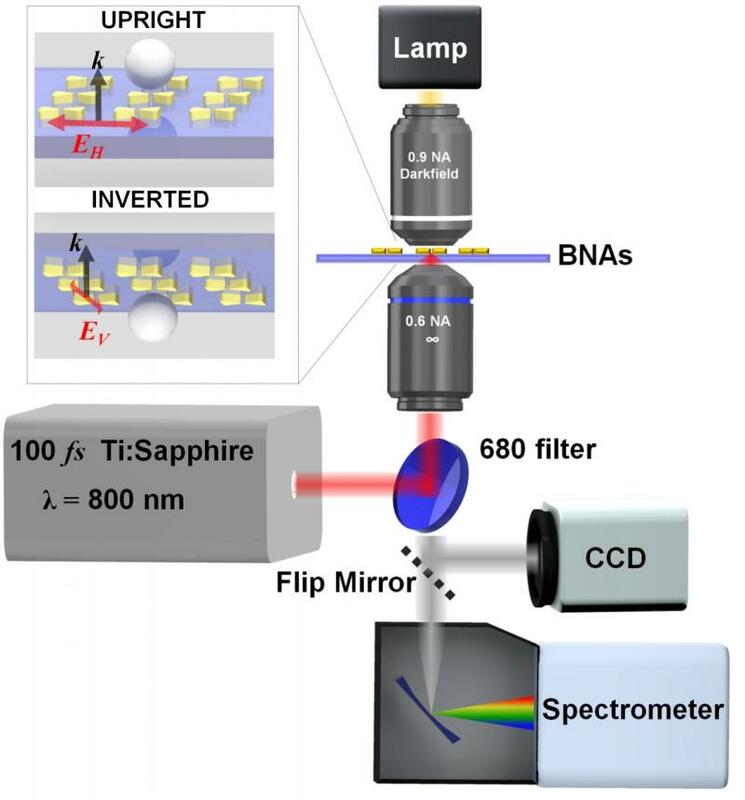 In their recent paper, “Femtosecond-pulsed plasmonic nanotweezers” published in the September 17 issue of Scientific Reports (open access), the researchers describe how a femtosecond-pulsed laser beam significantly augments the trapping strength of gold bowtie nanoantenna arrays (BNAs), and provide the first demonstration of use of femtosecond (fs) source for optical trapping with plasmonic nanotweezers. “Our system operates at average power levels approximately three orders of magnitude lower than the expected optical damage threshold for biological structures, thereby making this technology very attractive for biological (lab-on-a-chip) applications such as cell manipulation,” added Toussaint, who is also an affiliate faculty member in the Department of Bioengineering and the Department of Electrical and Computer Engineering. “We present strong evidence that a fs source could actually augment the near-field optical forces produced by the BNAs, and most likely, other nanoantenna systems, as well. To our knowledge, this has never been demonstrated,” said Brian Roxworthy, a graduate student in Toussaint’s PROBE (Photonics Research of Bio/nano Environments) lab group and first author of the paper. According to Roxworthy, the demonstration of controlled particle fusing could be important for creating novel nanostructures, as well as for enhancing the local magnetic field response, which will be important for the field of magnetic plasmonics. The paper also demonstrated enhancement of trap stiffness of up to 2x that of a comparable continuous-wave (CW) nanotweezers and 5x that of conventional optical tweezers that employ a fs source; successful trapping and tweezing of spherical particles ranging from 80-nm to 1.2-um in diameter, metal, dielectric, and both fluorescent and non- fluorescent particles; enhancement of two-photon fluorescent signal from trapped microparticles in comparison to the response without the presence of the BNAs; enhancement of the second-harmonic signal of ~3.5x for the combined nanoparticle-BNA system compared to the bare BNAs; and fusing of Ag nanoparticles to the BNAS.